Cinco de Mayo is just a few days away, and although I'm not of Mexican descent, I think that the colors and celebrations of Mexico can be so beautiful. My family loves going to Disney World, and the Mexico pavilion at Epcot is a favorite. Other than that time I was on a train headed for Tijuana (I got off several stops away), Epcot is as close as I've been to Mexico. But when you walk through, one of the things that you see first are the rows of tissue banners that hang everywhere. 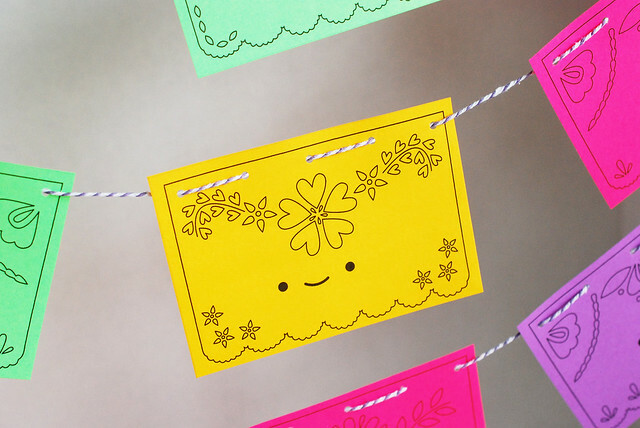 Papel picado is a form of folk art, and the tissue pieces are cut with all kinds of amazing and intricate designs. 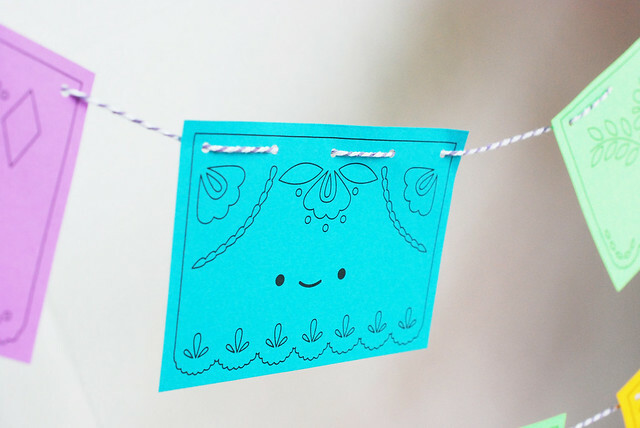 I highly recommend that you do a Google image search for "papel picado" because you'll be astounded! When Astrobrights challenged me to find a way colorize spring, it didn't take long before I knew that colorful banners were the way to go! I've had a slight love affair with paper for a very long time. I remember seeing my mom make photocopies onto Astrobrights papers when I was 11 or 12 years old, then I was in the graphic design department at school and pored over the paper sample books. How could I not be smitten? These colors are delicious! 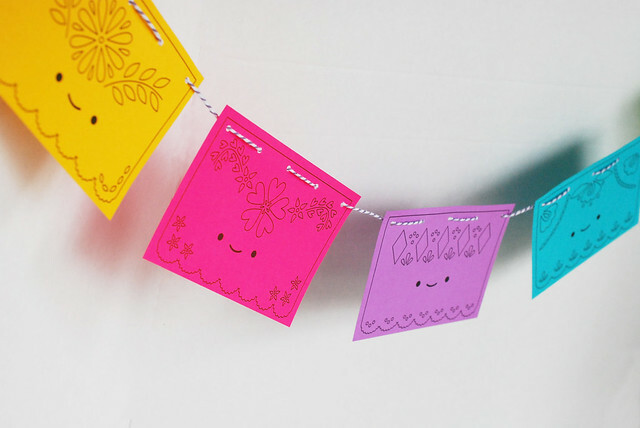 I chose some crazy brights for my banner (Galaxy Gold, Fireball Fuchsia, Planetary Purple, Terrestrial Teal, and Martian Green), but the Astrobrights color range is extensive, so you could easily choose more traditional, less neon, colors for your papel picado. 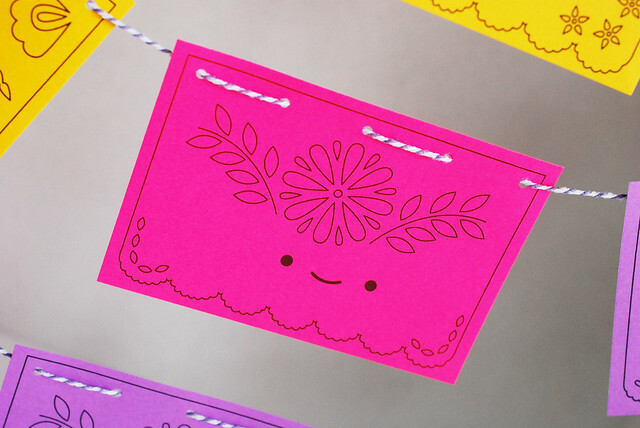 Download the Happy Papel Picado PDF. 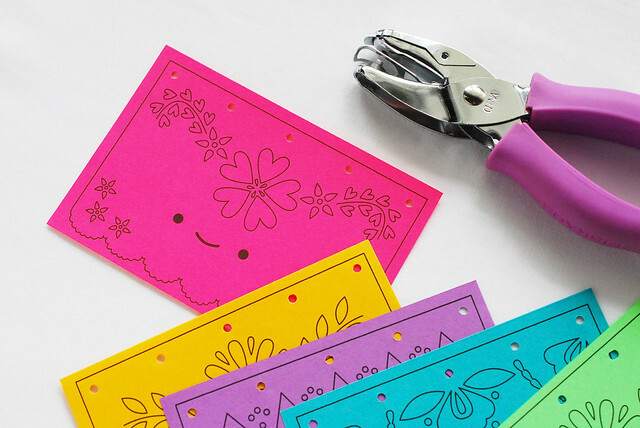 To save on all of the cutting that the real deal has, I've made these so you can print and trim with just a few straight cuts. Next, punch some holes on the marked circles. I used a 1/8-inch punch, but a standard hole punch will do. 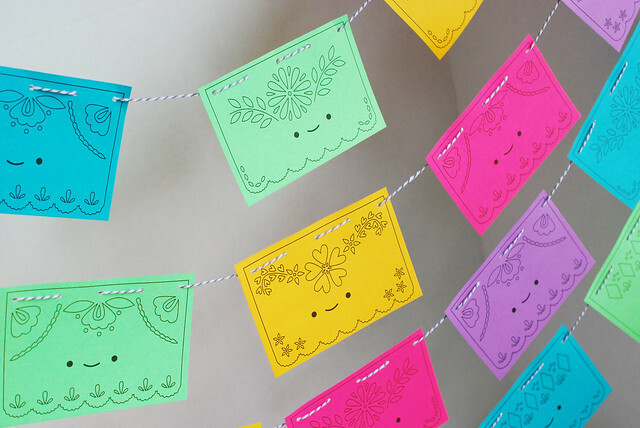 Thread some string through the holes, and get ready for a fiesta! ...or rows and rows! 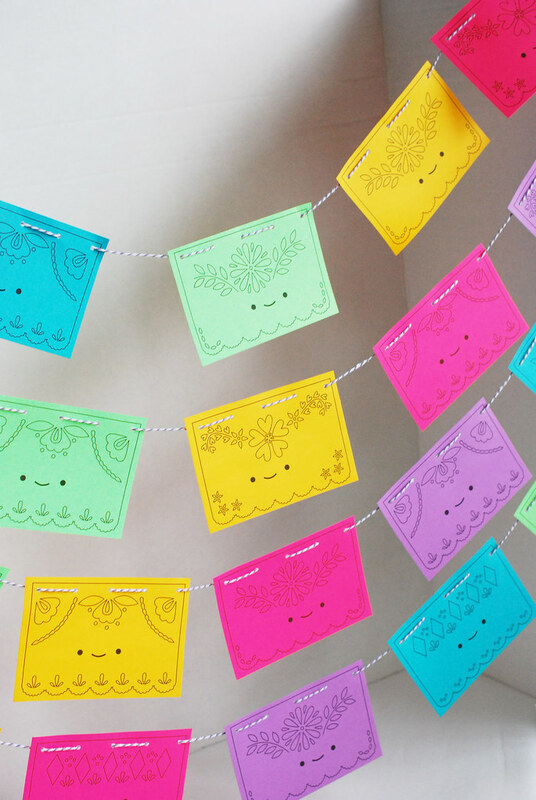 I'm obsessed with putting things in rainbow order these days, so my only regret is that I didn't print these in every Astrobrights color that they make to make one huge rainbow of banners. But guess what? YOU COULD MAKE ONE ENORMOUS RAINBOW OF ANYTHING! Know how? 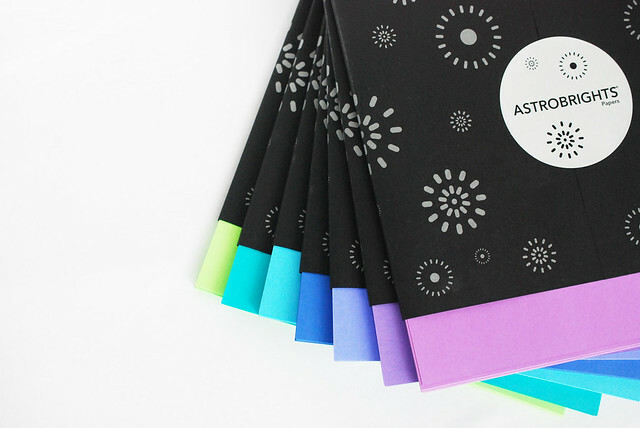 By entering a very amazing giveaway from Astrobrights! One lucky winner will get the same staggering sample box of paper that I got (it has some of every color! ), plus a $50 Office Depot gift card! When they asked me to colorize my spring, I couldn't turn down this opportunity for you! Enter below using Rafflecopter. Good luck! Regardless of whether you win or not, I hope you'll hang a bunch of these happy little banners around. 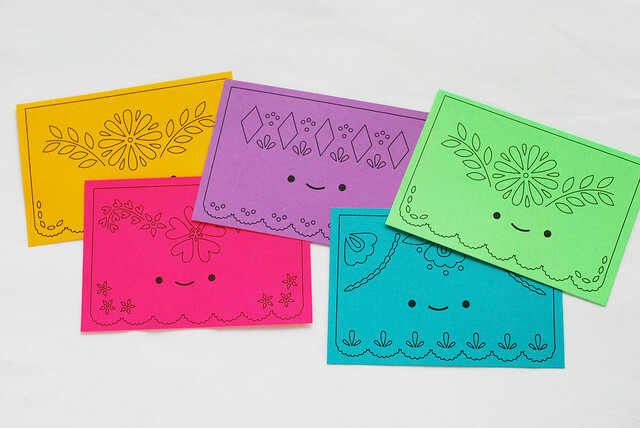 They're perfect for Cinco de Mayo or any time you want to bring some color and happiness to your days! Thanks to Astrobrights for making this post possible. And be sure to visit their Facebook page to see all kinds of lovely ideas that #colorize! Cutie cute cute! What bright colors! Oh my gosh!!! What lovely colours! I had never heard of AstroBright before, but now I'm smitten! 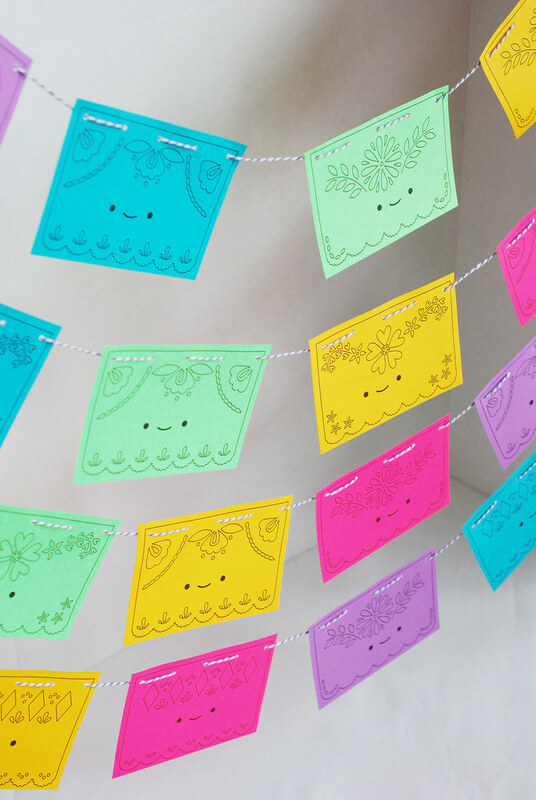 And I LOVE your papel picado design. Very nice. I'm not entering this one, but just wanted to say that the banner looks lovely. You are so right! These colors are amazing! super cute! I love the minty green color. Sorry! I didn't know we were supposed to leave the comment with our favorite color until after I commented. My favorite color is purple! My favorite is the teal. Thank you for sharing the happy banners. The purple and blue are absolutely adorable! 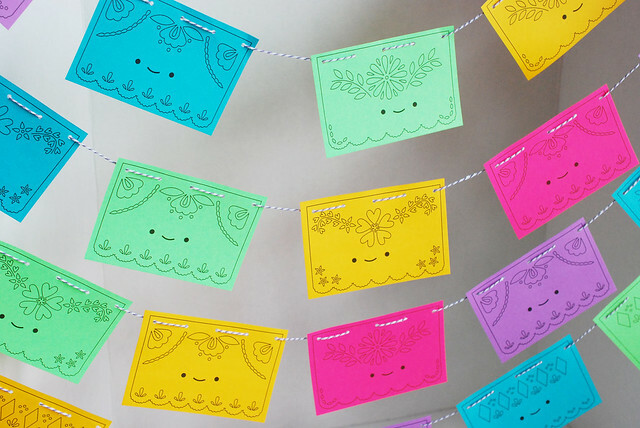 These banners are too cute! 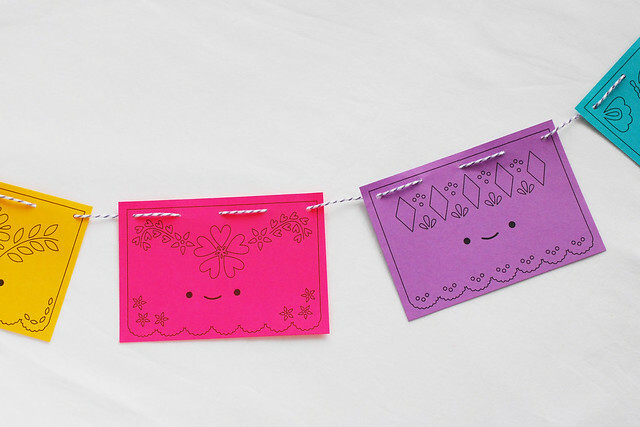 I can only imagine all the possibilities with the Astrobrights paper! What a cute idea! My favorite color is purple. Thanks! I'm starting to get paper obsessed as I am yarn and bead obsessed! I got a cricut for christmas and it is awesome. I'dlove to have a huge huge huge stash of paper to play with. I think probably teal and orange would be the first two colours to disappear! My favorite color is just about any shade of green (even neon green has started to grow on me :) ). Mine would be blue and leaning into teal. Blue and green and every shade between! I always use Astrobrights, at home and at work. I wouldn't be able to pick a favorite color, I use everything from yellow to green to pink and purple. Love them all! The way you talk about my mexico is so beautiful!! You inspire me in so many ways mollie!!! Living near a lot of Mexican restaurants I see these a lot!! I love these!!!! I'm really loving the yellow and bright pink! The blue is my fave! I love all the colors...especially the green! I love bright colors. I have bought their variety pack several times. I really like the purple and the pink. I think I will use this design for my library display. Pretty! My favorite color is red-orange. :) Thanks for the giveaway! So festive! I like any shade of blue. 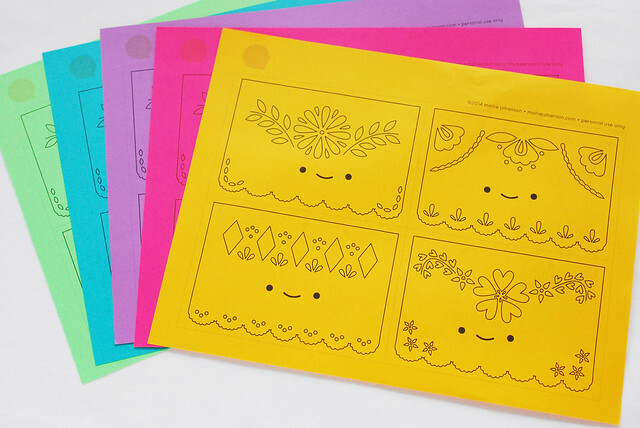 I used to work with these papers in a print shop and I loved them so so much! My fave is Mars Magenta. Definately purple! What a great blog!